Due to an exceptionally busy month, there have been increased demands upon all Foundation facilities, particularly with parking congestion and tram traffic. 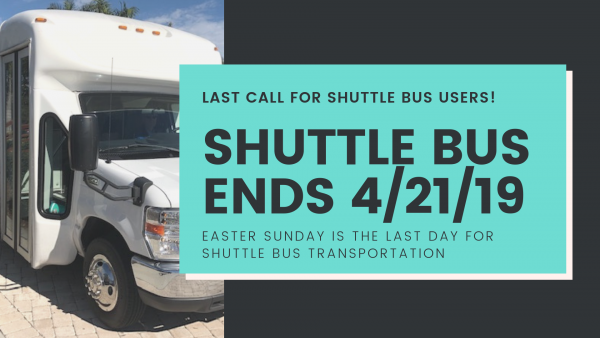 Therefore, the Foundation is reinstituting a shuttle bus service to residents along Pelican Bay Boulevard during various peak times beginning this Friday, March 15 and through Easter week. As noted in the schedule, there will be a three-day run from Friday to Sunday (with the exception of the entire Easter week), from 10 a.m. to 6 p.m. The full route will take approximately a 20 minute round-trip. It is important to note that objects that cannot be stowed on your lap or in front of you may not be brought onto the shuttle bus (ie. paddleboards, chairs, etc.) Also, the contracted drive will not be screening for valid Pelican Bay Foundation ID cards to board the shuttle bus. However, you will need your ID to board a tram or access the berm/boardwalk.